Caffeine has raised many health concerns over the past decade. Studies have been performed to observe the effects of caffeine. A previous experiment found that caffeine has an antibacterial effect on Escherichia coli (E. coli). This raises questions about the effect caffeine may have on other species of bacteria. To answer this question we took three species of bacteria (E. coli, Proteus mirabilis, and Caulobacter crescentus), cultured them, and added different quantities of caffeine to a portion of the bacteria samples (the experimental group). We also had control groups which contained bacteria without caffeine. Using a spectrophotometer we measured the growth rates of each bacteria sample over an 18 hour period. Our results showed that the caffeine had an antibacterial effect on all three species of bacteria, with C. crescentus being effected the most. These results show that caffeine can have an antibacterial effect which may be beneficial in regards to our health. Caffeine and other energy boosting compounds have become increasingly popular over the last few decades with the emergence of energy drinks, pre-workouts and new types of coffee. In the United States caffeine is one of the most heavily consumed stimulants in the American diet and it has been reported that Americans consume on average 200 mg of caffeine daily (Nawrot et al., 2003) . After caffeine is ingested ninety nine percent of the total caffeine consumed is absorbed in the gastrointestinal tract and is then delivered to the organs and tissues where it has been associated with a plethora of physiological responses based on many different variables such as the amount of caffeine consumed, tolerance of the individual towards caffeine and the physical health of the individual. Caffeine consumption has been shown to increase energy levels, alter mood and sleep patterns and at high doses it has been associated with arrhythmias and hypertension. However caffeine consumption in moderation has not been linked to any adverse side effects in healthy individuals (Leonard et al., 1987). The half-life of caffeine ranges from 2.5 hours to 7.5 hours, but the time that it takes to clear caffeine from the body can be decreased if the individual smokes or has liver disease (Gibson et al., 2012). In the last several decades the widespread use of antibiotics to fight bacterial infections has resulted in many bacteria developing resistances to the most frequently used antibiotics. There are bacteria species that have been so effective at developing an adaptive immunity to antibiotics that certain bacterial infections have become almost untreatable with antibiotics (Andersson 2003). Due to the fact that bacteria are becoming increasingly resistant to current antibiotics there is a strong need to develop new forms of antibiotics that bacteria do not resist. A study at the University of Karbala tested the effects of caffeine and aminophylline on bacteria and found that caffeine was more effective than the standard antibiotic ampicillin against the bacteria S. aureus and E. aerogenes. The researchers also found that caffeine at high doses was effective at killing E. coli, but not quite as effective as ampicillin (Al-Janabi, 2011). Contradicting these findings the bacteria Pseudomonas aeruginosa, which is considered to be a caffeine degrading bacteria, has been identified as having the ability to degrade caffeine and use it as a source of nutrients to further enhance its growth (Dash et al., 2009). Another such study showed that the bacteria Pseudomonas putida was capable of using caffeine as a carbon source and it had an elevated growth rate when exposed to high concentrations of caffeine (Gibson et al., 2012). The three bacteria that are going to be tested in this experiment are E. coli, P. mirabilis and C. crescentus. All three of the aforementioned bacteria are gram negative and rod shaped. E. coli is a facultative anaerobe with that typically inhabits the intestinal tract and is considered to be part of the normal flora in most humans and animals. E.coli is not typically pathogenic, however, it has been known to cause infections in some cases. The optimal growth temperature of E.coli is 37º C and the optimal pH range for the best growth is 6.0-8.0. P. mirabilis also normally inhabits the intestinal tract in humans. This organism is not usually pathogenic, but if it enters a wound or the urinary tract it can become pathogenic. P. mirabilis has an optimal growth temperature of 37º C and it is a facultative anaerobe that is capable of fermenting lactose. 16s rDna tests have revealed that Proteus mirabilis has an enzyme that makes it capable of degrading caffeine, but it does not appear that there has ever been a study performed where it’s growth rate was tested in the presence of caffeine (Thangaraj et al., 2013). C. crescentus is a heterotrophic aerobe that is flagellated bacteria and typically inhabits aquatic environments. C. crescentus grows the best in 30º C and it is not pathogenic so it has not been associated with any diseases. The purpose of this study is to test how caffeine will affect the growth rate of E. coli, P. mirabilis and C. crescentus. A previous study has shown that in the presence of high concentrations of caffeine that E.coli exhibited a reduced growth rate, but there does not appear to be any previous experiments that suggest how C. crescentus or P. mirabilis will respond to caffeine. The 16s rDna test performed on Proteus mirabilis that showed that it has an enzyme that degrades caffeine makes it likely that it’s growth will not be effected very much (Thangaraj et al., 2013). Based on the previous experiment performed on E.coli it is likely that those results will be duplicated and that it will have an impaired growth rate when exposed to caffeine (Al-Janabi, 2011). It is uncertain how C. crescentus will respond to caffeine because there does not appear to be any data suggesting how it will respond in the presence of caffeine. In the current study, we tested our hypothesis that caffeine will reduce the growth rate of E.coli, but it will not have a much of an effect on P. mirabilis. The isolated strains of bacteria for this experiment include three gram negative species which are C. crescentus, P. mirabilis and E. coli. The medium that was used for culturing the P. mirabilis and E. coli was the LB media and the PYE media was used to culture the C. crescentus. In order to assure that the results from this experiment could be replicated triplicates of each bacteria were used for the control and experimental groups. 135 microliters of each bacteria was added to each experimental and control group. The experimental groups then had 10 microliters of caffeine added to its media. The caffeine solution followed a 1:2 dilution ratio, and the lower caffeine concentration solutions were diluted with water. The starting concentration of E.coli was .016 ml, P. mirabilis had a concentration of .015 ml and the concentration of C. crescentus was .035 ml. 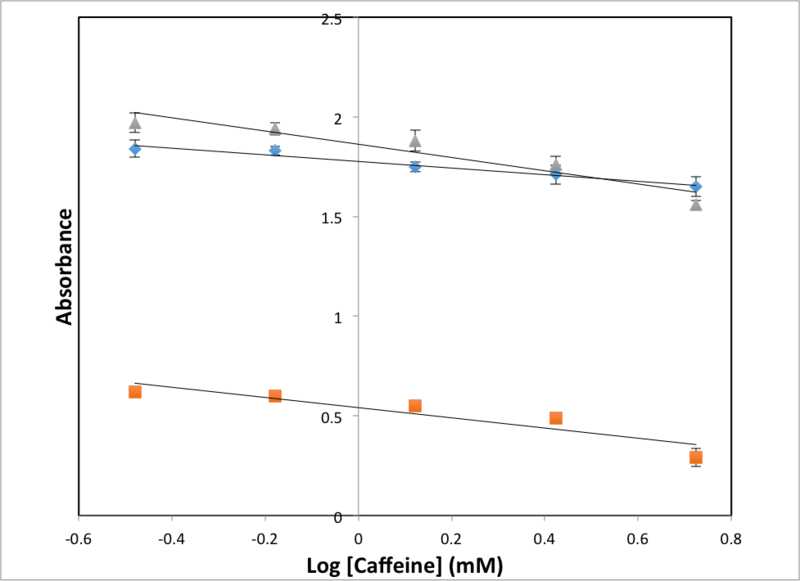 Five different concentrations of caffeine were tested in this experiment and the corresponding caffeine concentrations were 5.3 mM, 2.65 mM, 1.33 mM, .663 mM and .331 mM. The control groups did not have any caffeine added. 100 microliters of mineral oil was then placed over each sample of bacteria to prevent evaporation of the bacteria while it was incubating. The starting absorbance of each sample group was then measured using a spectrometer. 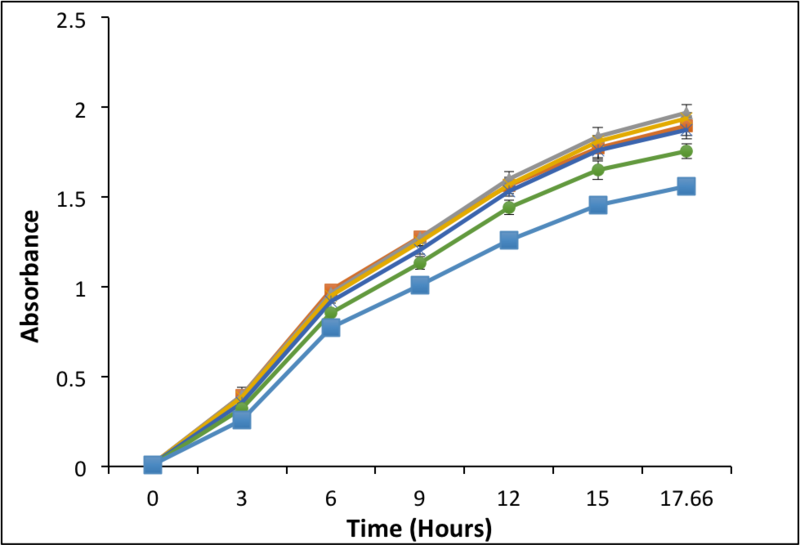 The bacteria was then allowed to culture for 18 hours at 30º C. At the end of the 18 hours the absorbance of each sample was then measured and compared to the starting absorbance. A higher absorbance corresponds with more bacteria in the sample. C. crescentus experienced the biggest decline in its growth when caffeine was added to its media. The control group, which had zero caffeine, experienced a faster growth rate than all of the experimental groups and it experienced more total growth for its last measurement (Figure 1). When comparing the final absorbance for the lowest caffeine concentrations (.331mM and .663mM) a one-tailed t-test revealed a p-value less than .05, which indicates that there was a small statistically significant difference when compared to the control. The next two successively higher experimental concentrations of caffeine (1.33mM and 2.65mM) had a slower growth rate and less total growth than the control and the difference was even more statistically significant than the previous groups because they both had p-values less than .001. The highest concentration of caffeine (5.3mM) inhibited the growth of C. crescentus much more than all of the experimental groups and had a p-value less than .0001 when compared to the control. There seemed to be a strong association with higher caffeine concentrations and less growth in C. crescentus, and by looking at the Figure 1 there seems to be a trend that shows as the caffeine concentration increases that the bacteria’s growth decreases. P. mirabilis experienced a very slight decline in its growth rate when exposed to the highest concentrations of caffeine (Figure 2). The two lowest caffeine concentrations (.331 mM and .663 mM) actually had slightly more total growth than the control group, but this difference was not significantly significant. There was no evidence that the growth rate was altered by caffeine with the two lowest concentrations. The third lowest caffeine concentration (1.33 mM) also did not exhibit a statistically significant difference in its growth when compared to the control. The experimental group that had 2.65 mM caffeine had a slightly statistically significant difference in its growth, when compared to the control group it had a p-value less than .05. The experimental group that had the highest amount of caffeine (5.3mM) had the slowest growth rate and the lowest total growth out of all the samples, when compared to the control the p-value was less than .001, which indicated there was a statistically significant difference in this group’s growth rate. Although P. mirabilis did not experience as strong as a reduction in its growth as C. crescentus there was still a trend in the data, which shows that the sample groups that had the highest concentrations of caffeine also had the lowest growth. 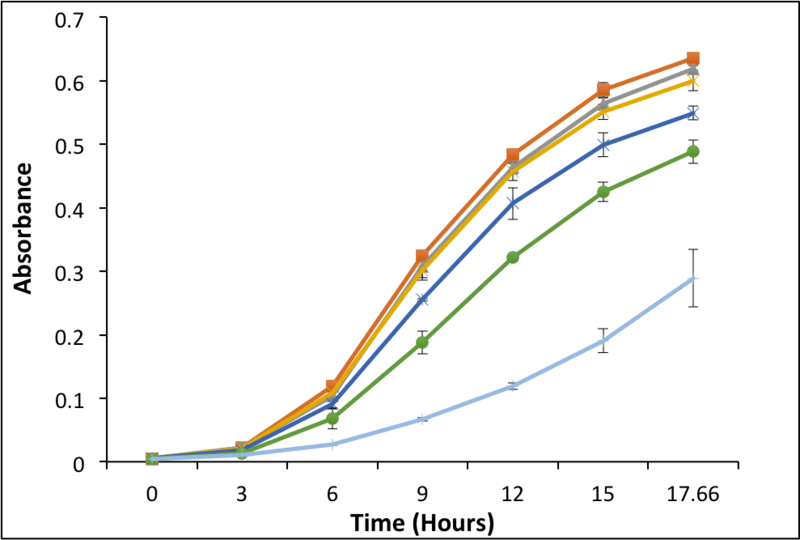 Caffeine did not have as great of an effect on E.coli as it did on C. crescentus (Figure 3). The two lowest experimental groups had a slightly higher end absorbance values than the control group and did not have a statistically significant difference in growth rate. The caffeine concentration of 1.33 mM experienced a very slight decrease in its growth, however, this difference was only slightly statistically significant because the p-value was less than .05. The final two groups experienced a slightly significant difference in growth when compared to the control. The sample that had 2.65 mM of caffeine had a p-value less than .05 when compared to the control group, which indicates that there was a slight difference, and the sample that had 5.3 mM of caffeine had a p-value less than .01 when compared to the control, which indicates that there is a small statistical difference. E.coli did not experience as much as a decline in its growth as C. crescentus did, but there was a similar trend when it is compared to the other two bacteria. The trend seems to show that the sample groups that had the highest concentrations of caffeine also had the lowest growth. A dose response curve shows that there is a linear relationship between caffeine and its ability to inhibit bacteria growth (Figure 4). Based on the data from this graph the effect of caffeine on bacteria does not seem to plateau and it shows that as the caffeine concentration increases that the bacteria growth steadily decreases. The information from this graph also shows that in order to attain a half maximal response that a dose of 5.15 mM of caffeine must be used for E.coli, 0.94 mM for C. crescentus and 2.64mM for P. mirabilis. The results of this experiment were not quite what we expected, so we have to reject our hypothesis. Out of all three bacteria E.coli had its growth rate impacted the least when exposed to caffeine. These results contradict the findings of the previous study, which showed that caffeine was able to inhibit the growth of E.coli to a greater extent (Al-Janabi, 2011). This could be because the concentrations of caffeine that were used in the other study were slightly higher than the caffeine concentrations used in this study. P. mirabilis was expected to maybe have a higher growth rate in the presence of caffeine because of a caffeine degrading enzyme that researchers found in its genome in a previous study (Thangaraj et al., 2013). P. mirabilis did not have its growth rate altered in the presence of caffeine at lower concentrations, however once the caffeine concentration was increased to 2.65 mM the growth of the bacteria did slow down compared to the control. This could indicate that the caffeine degrading enzyme is only effective at protecting the bacteria against caffeine at low concentrations. The results from C. crescentus were the most surprising because out of all three groups this particular bacteria was impacted by caffeine the most. When C. crescentus is exposed to higher concentrations of caffeine it appears to have a significant impact on this bacteria’s ability to thrive. There does not seem to be any information that indicates what causes this bacteria to be effected so much more than the other two bacteria, so it could be interesting to do research to figure out what causes this to happen. Based on the results of this experiment, caffeine may be an effective anti-microbial agent against some bacteria species, however it appears to effect each bacteria species differently, so more research needs to be done to determine what species will be effected by caffeine the most. Results from a previous study show that when 72mM of caffeine was applied topically to a rat that the caffeine absorbed through the skin and into the blood, but they found no evidence of caffeine toxicity (Kronschläger et al 2014). The researchers concluded that 72mM of caffeine was safe to be applied topically for humans because the equivalent dose in humans would be equal to five times less caffeine than one cup of coffee (Kronschläger et al 2014) The 72mM of caffeine used in the previous experiment was much higher than the maximum caffeine dose (5.3mM) used in this experiment. Another study that tested caffeine’s ability to inhibit bacteria growth was able to inhibit the growth of bacteria using caffeine concentrations much lower than the 72mM concentration that researchers found safe for humans (Al-Janabi-2011).The results from this study and the two previously mentioned studies may suggest that humans are capable of tolerating a much higher concentration of caffeine than bacteria. Therefore, future research should test the ability of higher doses of caffeine to inhibit bacterial growth, and the possibility of using caffeine as a topical anti-microbial agent. There was a trend between higher caffeine concentrations and lower growth rate of C. crescentus and P. mirabilis and E.coli, however it does not appear that low concentrations of caffeine effect the growth of P. mirabilis and E. coli very much. Future studies should test higher caffeine concentrations to determine if this trend continues and to test if much higher concentrations of caffeine can inhibit the bacteria growth to a greater extent. Future studies should also test gram positive bacteria because all of the bacteria tested in this experiment were gram negative. Caffeine may have the potential to be an effective anti-microbial agent against some species of bacteria and because it is widely available, inexpensive and harmful to humans only in high concentrations it may be a good candidate for future studies. We would like to thank Dr. Kwangwon Lee and Nicole Pope for all of the critiques and advise to help guide us through our study. We would also like to give a special thanks to Dr. Eric Klein for helping us perform and perfect our experiment. Figure 1: Caulobacter crescentus’s Growth Rate. This figure shows the growth rate of C. crescentus. The x-axis measures the time and the y-axis measures the growth rate with absorbance. The orange square is the control group, the grey triangle is .331 mM caffeine, the yellow x is .66 mM, the dark blue star is 1.3 mM, the green circle is 2.65 mM and the light blue line is 5.3 mM. Figure 2: Proteus mirabilis’s Growth rate. This figure shows the growth rate of P.mirabilis. The x-axis measures the time and the y-axis measures the growth rate with absorbance. The orange square is the control group, the grey triangle is .331 mM caffeine, the yellow x is .66 mM, the dark blue star is 1.3 mM, the green circle is 2.65 mM and the light blue square is 5.3 mM. Figure 3: E. coli’s Growth Rate. This figure shows the growth rate of E.coli. The x-axis measures the time and the y-axis measures the growth rate with absorbance. The orange square is the control group, the grey triangle is .331 mM caffeine, the yellow x is .66 mM, the dark blue star is 1.3 mM, the green circle is 2.65 mM and the light blue line is 5.3 mM (s.e.m). Figure 4: Dose response curve for each species. The x-axis measures a log of the caffeine concentration and the y-axis measures the absorbance. The yellow square is C. crecentus, the blue diamond is E.coli and the grey triangle is P. mirabilis. Error bars represent s.e.m. Kronschläger, M., Forsman, E., Yu, Z., Talebizadeh, N., Löfgren, S., Meyer, L.M., Bergquist, J., and Söderberg, P. (2014). Pharmacokinetics for topically applied caffeine in the rat. Exp. Eye Res. 122, 94–101. Nawrot, P., Jordan, S., Eastwood, J., Rotstein, J., Hugenholtz, A., and Feeley, M. (2003). Effects of caffeine on human health. Food Addit. Contam. 20, 1–30. Gibson, Adrienne M.; Morgan, Roderick M.; and Nikitin, Alexey G., "The Effect of Caffeine on the Bacterial Populations in a Freshwater Aquarium System" (2009). Student Summer Scholars. Paper 31 Dash, S.S., and N. Gummadi, S. (2008). 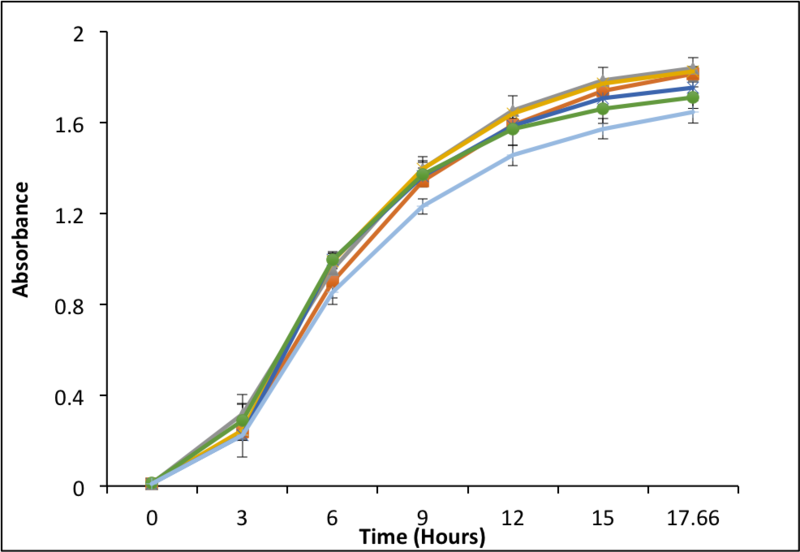 Inhibitory Effect of Caffeine on Growth of Various Bacterial Strains. Research Journal of Microbiology 3, 457–465. Gibson, Adrienne M.; Morgan, Roderick M.; and Nikitin, Alexey G., Macdonald, Nick. (2012) "Possible effects of the presence of common household chemicals in the environment: the growth of an aquatic bacterial species on a high concentration of caffeine." Journal of Biotech Research [ISSN: 1944-3285] Thangaraj, Naina., Siddharth, Sharan., Suneetha, Vuppu. (2013) Role of Proteus mirabilis in Caffeine Degradation- A Preliminary Bioinformatics Study. Research Journal of Recent Sciences Vol.2 (ISC-2012), 33-40 (2013) Leonard, TK., Watson, RR., Mohs, ME., (1987) The effects of caffeine on various body systems: A Review. J Am Diet Assoc. 87(8): 1048-1053. Al-Janabi, A.A.H.S. (2011). Potential activity of the purine compounds caffeine and aminophylline on bacteria. J Glob Infect Dis 3, 133–137. Andersson, D.I. (2003). Persistence of antibiotic resistant bacteria. Curr. Opin. Microbiol. 6, 452–456.